BPP Pro Bono Centre runs around 30 projects engaging law students to deliver pro bono legal advice and education services to improve access to justice. For more information about BPP’s Pro Bono Centre, please email probono@bpp.com. Stephen Cutter, solicitor with Release, a charity which provides a free confidential national information and advice service in relation to drugs and drug laws. The speakers gave a brief summary of their routes to qualification and beyond: both Heidi and Harriet had trained at Allen & Overy LLP and then taken quite different paths to where they are now, whereas Stephen and Amber are Justice First Fellows, having trained through the Legal Education Foundation (TLEF)’s scheme to sponsor more lawyers to become Social Welfare Lawyers. Stephen quoted TLEF chairman Guy Beringer’s recent comment that Social welfare law is ‘the law of real life’. If you are interested in training as a social welfare lawyer and want to find out more about the training contract and pupillage roles as Justice First Fellows, 2019 opportunities will be published from April – see https://jff.thelegaleducationfoundation.org/. When asked what gets them out of bed in the morning, Harriet admitted that the team at Reprieve are motivated by outrage at the injustices going on around the world in relation to Death Row prisoners and a feeling that something could be done if they give it a try. She said that the global abolitionist community of death row lawyers helps to provide a supportive group. Other speakers mentioned the feeling that they could make a difference and give something back and that they were satisfied by seeing improvements for clients. Amber spoke movingly about her work as an Immigration and Asylum lawyer. She was fascinated by learning about life and culture in different countries and the terrifying conditions many of her clients would face if they were sent back to their country of origin. She wants to keep winning for her clients and keep learning in her job. The Pro Bono Centre runs several projects working in Law Centres if students want to experience work in Law Centres. Heidi talked about the many city firms which either have a pro bono seat or have a requirement that trainee solicitors complete a certain number of pro bono hours during their training contract. She commented that doing pro bono can really raise a trainee’s profile in a firm as well as equipping them with additional transferrable skills. For someone doing a city firm training contract, working on a pro bono case may be the only opportunity to meet and interact with clients and develop empathy and resilience as well as interviewing and researching and letter drafting skills. All the speakers mentioned the vulnerability of many of their clients who may be suffering from depression, anxiety and post-traumatic stress or have other mental health issues. They spoke of the need to have a good team around you to allow you to talk about the difficult situations encountered and decompress a situation. Stephen mentioned the campaigning arm of Release and other charities like his who seek fairer drug laws and stop & search powers. Heidi explained that it is more difficult for Law firms to take up political activism but noted that they will sometimes raise their head above the parapet; for example Mayer Brown’s US colleagues did represent people at airports during Donald Trump’s travel ban. 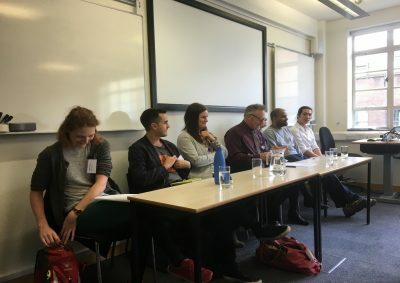 The overall message of the event was the immense job satisfaction gained from doing something you care about, and that if you take a more traditional path into a career in, say, commercial law, you should still get involved in pro bono as it will improve your career and your life and keep you motivated.